Ohau Quarry had issues with face rock getting past the skirt, resulting in significant damage to the belt. Typically the conveyor belt would be changed out every 3 months due to the re-occurrence of the impact damage, caused by the large, sharp face rock lumps striking the belt. Entrapment damage was also being experienced, created by friction between the rock material on the belt, the belt surface and the bottom of the skirt board when the belt sags. The conveyor belt is the most important, and most expensive, component in the conveyor belt system. While all conveyor belts will wear out over time, to ensure reasonable return on investment, damage should be avoided where possible. First a belt support system was installed underneath the conveyor belt at the impact zone. The K-Sure® Belt Support is designed to support the belt and provide a consistent and stable support for the troughed conveyor belt profile. It was retrofitted, utilising the existing idler frames so no pre-engineering was required. It operates by replacing the existing wing rollers with strong, highly durable low friction polymer slider support rails. It was simple to install and will require minimal ongoing maintenance and no adjustments. 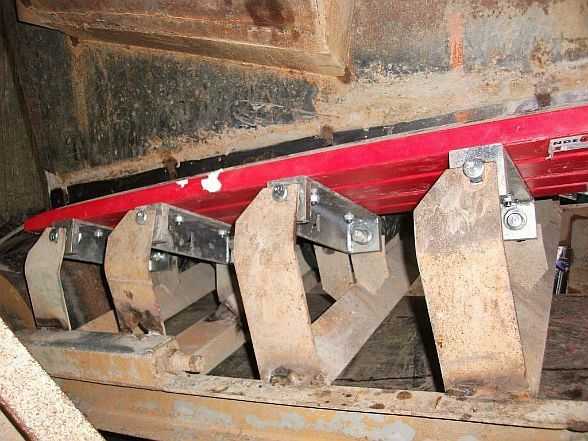 Once the belt was supported adequately, conveyor skirting can function along a flat, sag-free belt line. The K-Containment Seal is a high performance skirt system that offers exceptional resistance to wear. The slotted system arrangement extends its service life by allowing for further ongoing adjustment after initial installation. Since installation in July 2014 Ohau Quarry Manager has reported to us that they have had no issues with belt sag or belt damage and the same belt is still in operation coming up to 2 years later.